You are here: Home / Negotiation / Can We Talk Nice to Each Other? 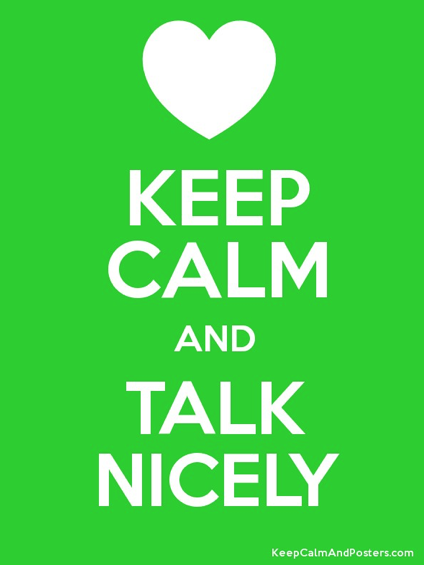 Can We Talk Nice to Each Other? I was having a conversation recently with a supervisor who is having some issues with two of his direct reports who are in conflict. As is the case in many situations I’m called into, the employees are not talking with each other. Not talking with each other seems to be an acceptable way to “get along” in some people’s minds. Although détente obviously provides some temporary relief, it’s not really a workable solution in the long run, especially if you have to work together. The definition of collaboration means labouring together – working together. There are not any workplaces I know that have “getting along” as part of their job description or core competencies, and that’s something I’ve dreamed of for years! Wouldn’t it be lovely if everyone was expected to “get along” at work, at home and in society – and especially in politics and in social media. Where did we fall so far off in terms of civil discourse? There have been new bullying and harassment legislation and guidelines in British Columbia the last few years that has made the topic of respect a higher priority. However, what can often happen is that individuals become focused on accusing the other of not respecting them and multiple accusations of bullying and harassment abound. That doesn’t make for a comfortable or safe environment to engage with differences and come to new understandings. Instead, as I advised this supervisor today, can we all hold up a principle of a higher standard for getting along? Can we expect that our employees (and politicans and citizens and families and friends) engage in differences in a civil way? How would we define that? And what do we do if we believe someone else is not acting in a way that is kind? I think it starts with having a common definition of what we mean by respectful language. Marshall Rosenberg, in his seminal book Non-Violent Communication provides such a basic roadmap. Link feelings to needs.This concept is a lot more complex than it appears.Many people I’ve seen in training settings, coaching settings and as part of my work as a mediator, seem to express feelings as judgements (see above practice).The person will say some variation of:“I feel you are… an idiot…”That is not a feeling.Expressing what we are feeling is a complex process that involves feeling what sensations you might have going on in your body (as feelings arise in our body) and what meaning have you attached to those particular bodily sensations?Anger can feel like a tightening of a jaw to some people, but to others anger is a flushing hot sensation.Linking feelings to needs requires us to have some sort of needs vocabulary – whether that’s learned from Maslow or David Rock or some other theoretician who articulates what our basic human needs are.Talking with each other about what our feelings and needs are, helps to open the dialogue of understanding.What I believe to be true (and have witnessed over the decades as a conflict intervenor), is that talking about our observations, feelings and needs, sets the stage for understanding and once we arrive at mutual understanding, problem solving is virtually assured. What do you think about these two as the basic principles of how to practice respect? Would you add on others? Also, in my new podcast “On Conflict” (releasing October 4 with Gordon White), the October 11 podcast includes a robust discussion with Elizabeth May about civil discourse. Remember to listen in to our weekly podcasts – starting October 4th and every Thursday thereafter!